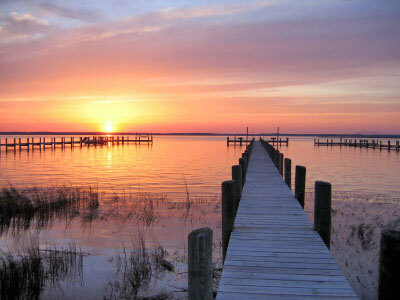 The Chesapeake Bay is located on the East Coast of the United States and has shoreline in both Maryland and Virginia. The major cities in the area are Baltimore, Norfolk, Hampton, Portsmouth, and Washington D.C.. The Chesapeake Bay is the largest estuary in North America. An estuary is a partially enclosed area where the fresh water from rivers mixes with tidal salt water. The waterways that feed the Chesapeake Bay make up a watershed covering an area of 64,299 square miles, including parts of Maryland, Virginia, New York, Pennsylvania, Delaware, West Virginia, and Washington DC. Recognition of the fact that activities anywhere within this watershed area can potentially impact the Bay has led to a joint effort from these states to protect the Bay’s water quality. The Bay was formed over 10,000 years ago when melting glacial ice caused sea levels to rise in the Atlantic Ocean. The rising waters of the Atlantic Ocean backed up into the Susquehanna River Valley, creating a new bay. The bay that was created by the flooding of the Susquehanna was know as Chesepiooc by the Algonquin Indians who were living around the bay when the first European settlers arrived. The meaning of the Algonquin word “Chesepiook” is unclear. While it was once commonly believed to translate to “great shellfish bay” an Algonquin linguist stated in the Washington Post that the word may mean “Great Water” or refer to a village at a big river. Captain John Smith explored and mapped the Chesapeake between 1607 and 1609. In his journal, he said of the Bay, “Heaven and earth have never agreed better to from a place for man’s habitation.” We have to agree – the Chesapeake Bay region is a wonderful place to live.